Many people have a tried-and-true way of preparing a turkey that they prefer. Some people like to use a slow-roasting method that involves roasting the turkey in the oven overnight at low temperatures. While this method can produce a tender and flavorful bird, it is not without risk. 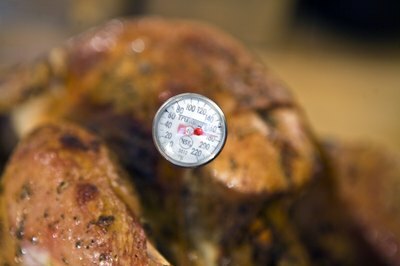 According to the USDA, you should not roast a turkey at temperatures below 325 degrees F because of risk of food-borne illness. Even with this risk in mind, however, many people still opt to slow roast a turkey overnight in the oven. Let eHow help you with your Thanksgiving turkey meal. 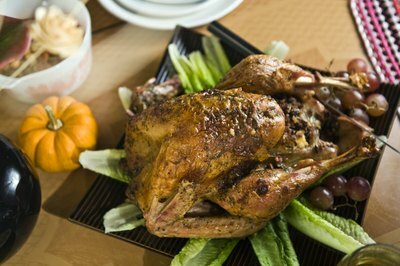 Download the eHow "Turkey Time!" app to figure out how much turkey you need, how long to cook it, and a timer to remind you when it's all done! Thaw the turkey completely in the refrigerator prior to roasting. 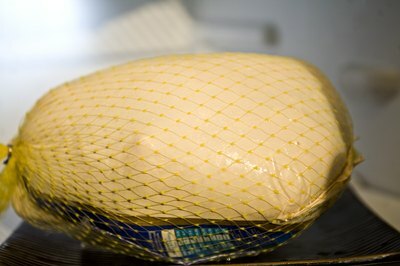 Never thaw a turkey at room temperature due to risks of foodborne illness. Remove the thawed turkey from the refrigerator and unwrap it. Wash the turkey thoroughly in the sink by running cool water over the bird. 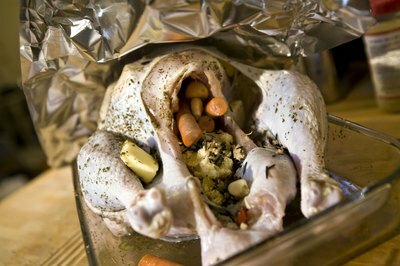 Remove the neck and any giblets from the cavity of the turkey and fill the cavity with cool water to wash this as well. Drain the water from the turkey and pat it dry with paper towels. Place the turkey into the roasting pan with the breast side facing up. Season the turkey with herbs and spices according to your taste. 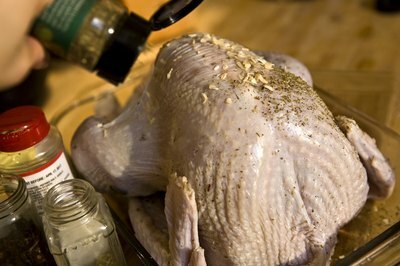 Suggestions for delicious seasonings include salt, pepper, tarragon, sage and poultry rub. Sprinkle your seasonings of choice liberally over the turkey as it sits in the roasting pan. Add 1 cup of water to the bottom of the roasting pan to provide moisture for the roasting turkey. Place a large sheet of aluminum foil over the turkey to cover it loosely. Preheat the oven to 350 degrees F and place the turkey into the oven. Allow the turkey to roast at this temperature for one hour. 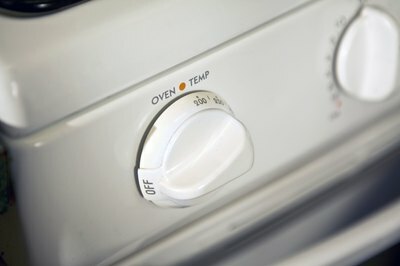 Reduce the oven temperature to 195 to 200 degrees F and leave the turkey roasting overnight. Note the time you reduce the oven temperature because an average size turkey (approximately 12 pounds) should roast for approximately seven hours at this temperature to cook all the way through. Adjust your roasting time up or down according to the size of your turkey. Check the internal breast temperature of the turkey approximately seven hours later. Insert the probe of the thermometer deeply into the turkey breast. When the thermometer temperature registers 165 degrees F, the turkey has finished roasting. Remove the turkey from the oven and allow it to rest on the counter for approximately 30 minutes before carving it. If you desire crispy skin, remove the aluminum foil tent for the last hour of roasting time. 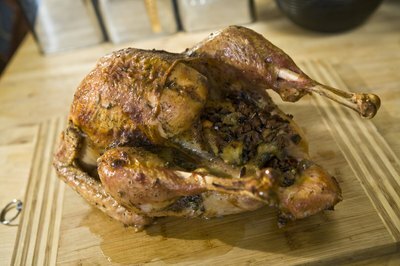 Turning up the oven temperature at the end of the roasting time will also help the turkey skin to become dark and crispy. 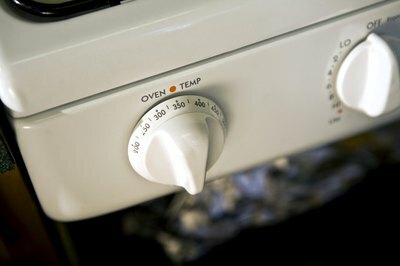 Proper reheating techniques, using gentle heat and added liquid, keep roast turkey leftovers moist and succulent.